Where is Big Sur? And How Can You Get There? 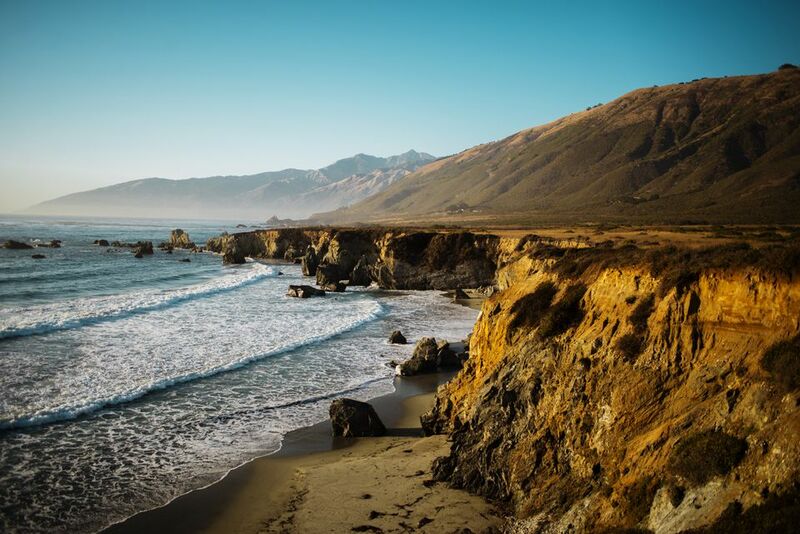 Before you can find out how to get to Big Sur on the California coast, you need to know where you're going. Other California places may have definite boundaries on a map, but Big Sur isn't one of them. Snuggled between the Santa Lucia Mountains and the Pacific Ocean, it extends more or less from San Simeon to the Carmel River. If you search for Big Sur using an online map or app, you may find a pin dropped in the middle of the mountains. That probably isn't where you want to go. You might also see a community named Big Sur on the map, about 30 miles south of Carmel. It's in the middle of the area people call Big Sur, but not on the coast. Instead, it's located in a forested, inland area along the Big Sur River. The only way to drive through Big Sur is on scenic California Highway One. It's a road known for winding turns, knuckle-whitening cliffs and the gorgeous views that make driving it worthwhile. To get to Big Sur, you'll have to get onto Highway One, no matter where you're coming from. A bridge replacement project on California Highway 1 will cause major delays and detours well into 2018 along this section of highway. Here's how you can cope with the road closures and what to do to see the views you've been dreaming about. These directions will work for autos and motorcycles, but if you're trying to get to Big Sur on a bicycle, you won't be able to ride on sections of US Hwy 101, which are controlled access. You probably want to know what there is to see and do on the way to Big Sur. We've got you covered. Check out the mile-by-mile guide to Highway One for lots of ideas and tips. From the South: If you are coming from Los Angeles, Santa Barbara or anywhere else south of San Luis Obispo, exit US Hwy 101 at San Luis Obispo, then follow CA Hwy 1 north through Morro Bay. You can also exit US HWy 101 onto CA Hwy 46 west north of Atascadero and join CA Hwy 1 just south of Cambria. From the North: If you are getting to Big Sur from San Francisco, San Jose or anywhere else north of Monterey, take US Hwy 101 south to CA Hwy 156 west at Prunedale, then take CA Hwy 1 south. You can also get to Hwy 1 from 101 via CA Hwy 68 west through Salinas. If you are in Santa Cruz, Carmel or Monterey, just follow CA Hwy 1 south. Let's start with things that won't work. There's no train to Big Sur. The big bus companies like Greyhound don't go there, either. You can get to Big Sur from Monterey or Carmel by public transportation on Monterey-Salinas Transit Line 22. It will take you as far south as Nepenthe Restaurant. Guided tours are another way to get to Big Sur. You can take a private day trip there from San Francisco with A Friend in Town or Blue Heron tour companies, both owned by trusted friends who offer fantastic trips. If you're going through Big Sur on your way to Los Angeles, Green Tortoise offers a 3-day trip down the coast. Other commercial companies also offer trips through Big Sur. You can find them by searching online for "big sur bus tour." No matter which direction you get to Big Sur from, you need to know that the road sometimes closes because of landslides. That happens most often during the winter rainy season. Use this guide to find out how to check conditions and find detours. Where Can I Watch California Condors in California?